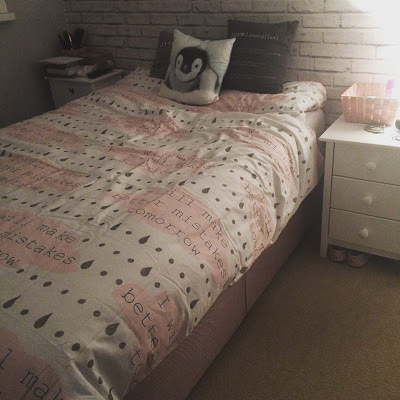 After spending the morning on Bloglovin’ (follow me the blog here), I came across Abi’s AM/PM routine tag and you all know how much I love tag post! I wake up and drink a glass of water first. If I have time, I’ll just use a make-up wipe on my face, throw on my workout clothes and get active! If not, I will cleanse my face properly, get dressed and start my day off. I rarely eat breakfast. I tend to just have a drinking yoghurt and have a hot chocolate later on. If I’m chilling at home for the day, I’ll have toast or crumpets mid-morning. I drink hot chocolate only. I used to have to wake up at 5am and be out of the door for 5.45am so I can get ready pretty quickly. It only really takes me half an hour really and then I use the other 15 minutes to make a drink and pack my lunch. After moisturising, I use Rimmel Match Perfect Foundation and apply with a brush. Next I use concealer (I’ve forgotten what brand mine is!). Then I curl my eyelashes and use No 7 Stay Perfect Mascara and then usually pick a colourful lipstick. I’m not into high-end brands for make-up so for lipstick I am all over Wilko’s Essence range! I remove my make-up with a face wipe first before cleansing, toning and double moisturising. If I’m getting a shower, I’ll exfoliate or use a face mask. Anything sweet. I’ve tried to stop snacking after tea but when it doesn’t work, I reach for anything chocolate or gummy sweets! I love to read before bed; ever since I was little, reading before bed has helped me to get a better night’s sleep. I tend to wear a matching top and shorts/bottoms because my house is pretty cold most of the time! I always make a to-do list before I go to sleep so I know what I have to do the following day. I lay out my outfit and my workout gear and I put my phone on charge.